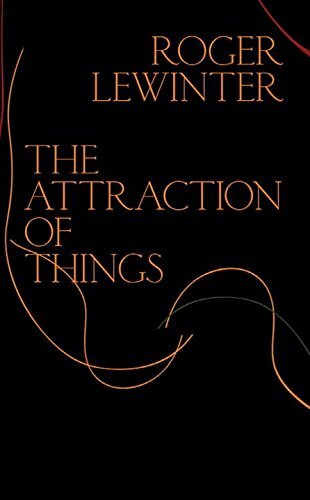 Written with a spectral intensity, The Attraction of Things by Roger Lewinter has the subtitle Fragments of an Oblique Life. In a series of diary entries Mr. Lewinter examines his passions as they interweave with the events of his life. Dating from August 1980 to May 1983, he constructs a memoir that is also a series of analytical essays. This species of autobiographical writing defies the usual conventional literary taxonomies. Is it an essay? Is it a memoir? Lewinter defies the confines of either/or. Rachel Careau performs a heroic feat with her translation, capturing the subtle gradations inflaming Lewinter’s various passions. He recounts his time as an amateur player in a production of Antigone. His other passions include collecting rare gramophone records and translations. During this interval he writes about his dying parents. Yet each diary entry is infused with all these things—theater, records, translation, dying parents—to such a degree that separation would be like tearing apart a tapestry. Each element becomes so tightly woven they achieve a spectral intensity. One passion blending into the other as to be seamless. In a short paragraph prior to the diary entries, Lewinter explains his methodology. “The oracle of Apollo, at Delphi, notably consulted by Oedipus, was known as the oblique oracle. The oblique is the shortest path of destiny, the direction of a life that places itself outside straight lines, which the oblique crosses in the manner of a short circuit, quick as a flash.” He continues, saying this is a story “of a being who lets himself go towards what attracts him, toward what he attracts—beings, works, things—, and who, through successive encounters, finds the way out of the labyrinth, to the heart, where passion strikes.” He seeks personal enlightenment not through repressing the passions, but setting them free. Inhabiting the rarefied world of opera, classical theater, and literary translation, Lewinter floats among the highbrow. His diary entries reflect an active participant who is simultaneously an acute observer. Each observation polished to a crystalline brilliance, Nabokovian in execution. “La Argentina [an old Japanese dancer], whose vision by its sheer strength had revived Spanish dance, which at the time had nearly fallen into obsolescence, must, in her pure brilliance, have embodied grace; and it wasn’t particularly suprising that, now once again, she could so enrapture an aging Japanese dancer: in the realm of art, the distinction between life and death loses its relevance, the one taking place in the other, both equally done away with for the spirit that, through beauty, signals the profound transition.” In the previous paragraph, he wrote about his dying father. Beautiful prose isn’t what makes Lewinter worth reading. He welds this prose to intense emotions and his individual experience. With a jeweler’s eye toward the smallest detail, he exhibits his intimate passions. These passions rule over him, yet he acts neither as a libertine nor an ascetic. Roger Lewinter casts an exacting eye upon himself, creating in prose a self-portrait worthy of Rembrandt.